The horn tooters have to wait at least another month before the recession is over judging from the non-manufacturing ISM numbers. 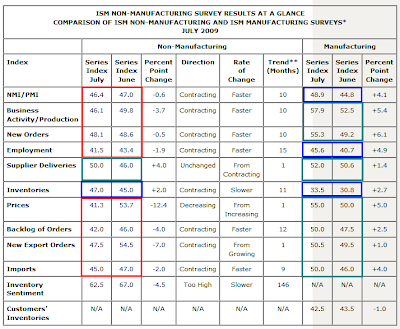 Please consider the July 2009 Non-Manufacturing ISM Report On Business®. The report shows the NMI (Non-Manufacturing Index) dropped .6% in July to 46.4, contracting for the 10th consecutive month at a slightly faster rate. The table shows that 8 out of 10 Non-Manufacturing components are worse this month than last month. Only deliveries are in the green while inventories are contracting at a slower rate. By contrast, 7 out of 10 Manufacturing components are in the green and the other three are contracting at a slower pace. I compared the 10 numbers that had direct equivalents. Looking at the data, one has to wonder if the manufacturing numbers are an outlier and/or skewed by auto manufacturing anomalies. Regardless, the NBER is unlikely to declare the end of the recession on numbers like these. Put away your party hats and horns for at least another month. "We ran some regressions that suggest that the equity market is already priced for the ISM to hit the 51 mark — as we saw in February 2002 when the index pierced 50 amid visions of a sustained inventory cycle, it was right at that time that the S&P 500 began to sputter. That's the problem when all the good news — and then some — gets discounted so quickly. We still think disappointment will inevitably set in over the sustainability of an inventory re-stocking that fails to be backed up by a revival in consumer demand." Indeed. The Global GDP Rebound Is Underway, But Who's The Buyer? The answer of course is government, not the consumer, except for inventory rebuilding and "free money" programs like "cash for clunkers".